Caledonia Car Wash is a two bay, manual car wash, and is tough enough to handle even the toughest mud job, but delicate enough to take care of your car’s finish. We offer soak, wax, high pressure rinse, music running continuously and security cameras streamed for your protection. 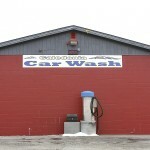 Open 24 hours, seven days a week, Caledonia Car Wash accepts quarters, bills or credit cards. There is also a car vacuum on the premises.